Today I am grateful for this meme and for Rachel at Journeys with Autism who doubly honored me by tagging both my book and me in a book meme. I was grinning from ear to ear when I read that she likes my novel and then further down the post she tagged me for the meme because she knows how much I love books. But alas I fell off the blog sphere radar was distracted this week. 3. For every book you are reading, you have to tag one person. I recently finished reading The Uncharted Path: My Journey with Late Diagnosed Autism by the afore-mentioned Rachel B. Cohen-Rottenberg. It is an insightful gem which I highly recommend especially to those of you who are parents of girls on the spectrum. You can find out more about it on her blog or at Amazon.com. Rachel, thank you so much for sharing your life with us! Love and War: The Civil War Letters and Medicinal Book of Augustus V. Ball edited by Donald S. Frazier and Andrew Hillhouse and transcribed by Anne Ball Ryals, was my birthday gift to myself. This book is actually about my family. Dr. Augustus V. Ball was the brother of my direct ancestor. There are two letters in the book from Augustus’ dad who was also my ancestor. I have been skipping around the book because of family ties, but I love what I have found. This book includes information from pre-civil war to its aftermath along with medical recipes for treating various illnesses. I think today we would call him a naturopath. Now you know my secret; I am a history fanatic buff and when I have that rare spare moment I get self-absorbed lost in family history. 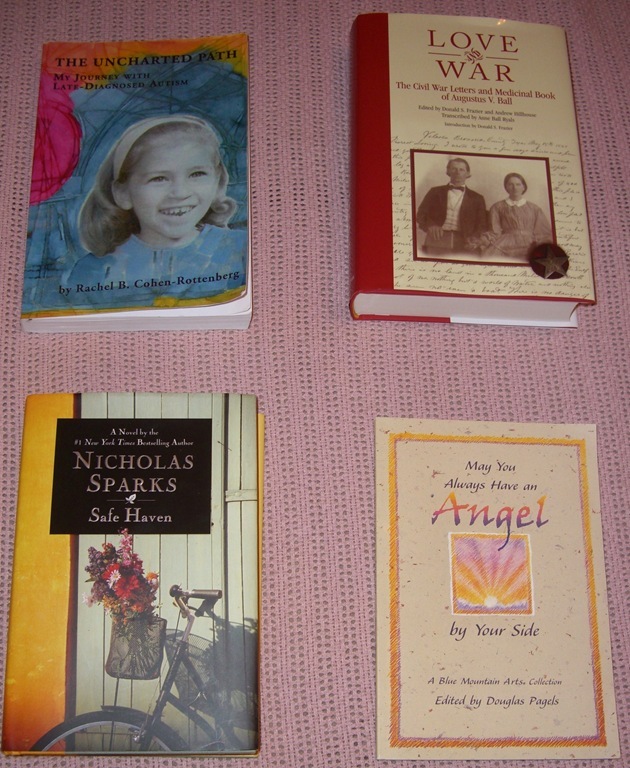 Safe Haven by Nicholas Sparks is an enjoyable easy read about a young woman named Katie who has a mysterious past. I am only half way through it, but so far it is entertaining and a good way to escape from reality for a while. I always enjoy reading Nicholas Sparks’ novels. It is my guilty pleasure. May You Always Have an Angel by Your Side; edited by Douglas Pagels is a collection of quotes and poems about angels another of my favorite things. I definitely believe in angels both in human form and otherwise. So now you know! I either focus on autism or escape it depending on my mood and how much time I have. Suzanne atAutism Mom Rising because I know she is a very spiritual person. Lisa at Karma Per Diem who is also a southern belle who loves books. Kelly at Puzzle Piece Princess who certainly understands the need for more education about how autism affects our girls. Grace at Blessed Elements when loves reading, positive messages and angels as much or more than I do. I am truly touched by your compliment. Thank you! Thanks for the shout-out, Sue! I’m really glad that my book was so helpful to you. And that history book, with information about your family: Wow! I love learning about family history–either mine or that of people I know. Such fun! I am still waiting for you to post the old pictures of your family you promised. I knew you would appreciate the history book. You are very welcome for the shout out! I do not want to get sappy here, but you and your book have been most helpful. I really am very grateful. Thank you! I sometimes think I have too many interests and I certainly do not have time to spend on them, but when I do find the time it is fun! I will go off and hunt for a suitable blogger for this meme. I like movies too, but given the choice of a good book or a good movie, I’ll take the book. I think history is important especially when we learn from mistakes of the past. How interesting! I keep meaning to buy Rachel’s book, now it’s definitely going on my birthday list. Yes, Rachel’s book would make a good birthday present. I will do this meme soon. Thanks! Oh, I love this!!! We’re leaving for a short 24 hour trip, but upon my return, I shall complete my task!